LEED v4 Building Design + Construction Guide (BD + C) applies to buildings seeking LEED Certification that are being newly constructed or going through a major renovation – New Construction, Core and Shell, Schools, Retail, Healthcare, Data Centers, Hospitality, Warehouses and Distribution Centers. The available Indoor Air Quality Assessment Credit Options are being explored by architects and builders more and more as they strive to achieve their desired level of LEED V4 accreditation. This route is worth 1 Point within this Credit. This is the longer of the two available flush out routes in that all of the outdoor air per square metre is required before occupancy so that it has greater schedule impact. This is the intermediate option from an occupant air quality perspective as it provides a large volume of air to remove harmful substances, but it does not provide a quantitative air quality value. This route is worth 1 Point within this Credit. This is the shorter of the two available flush out routes in that one-quarter of the outdoor air per square metre is required before occupancy so that it has lower schedule impact. However, this is the lowest quality option from an occupant air quality perspective as it exposes them to higher levels of potential toxins while the remainder of the flush out outdoor air volume is achieved. This route is worth 2 Points within this Credit. The schedule impact of this route is much less than a full flush out as it takes less time to conduct the testing on-site. This is the best route to show that the source control measures implemented on the project have been successful in producing occupied spaces with air quality better than the measured limits. In August 2017, construction firm John Sisk & Son and environmental consultancy, Environmental Efficiency, set out to achieve a possible two credit points using the relatively unexplored Option 2. This option concerns the Indoor Air Quality credit for the LEED BD+C: New Construction v4Certification. 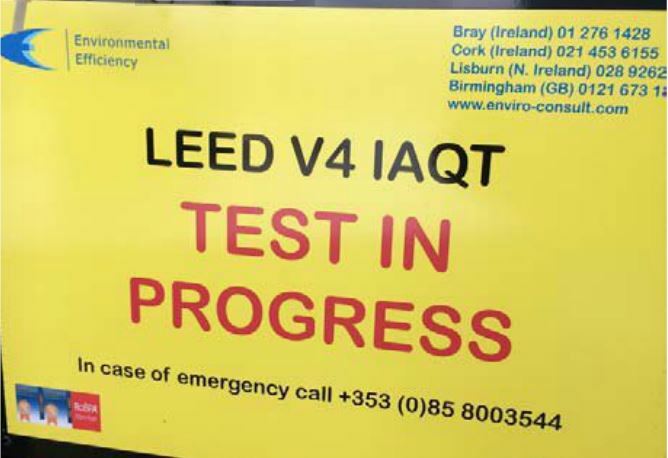 This LEED v4 project was for the administrative offices of one of Ireland’s largest data centres. Option 2 has often been overlooked as it seems overly complicated and expensive. However, this couldn’t be further than the truth. In fact, this option has the benefit of not requiring weeks or months of flushing out the building, which saves a huge amount of time for both the client and building contractor, potentially saving thousands of Euro’s and enabling building handover in a shorter timescale. The credit option followed on from the Low-Emitting Materials Credit and Sisk decided early in the project not to use any products inside the building that exceeded the limits set out in the EU Deco paints, SCAQMD Rule 113 (paints & coatings) and SCAQMD Rule 1168 (adhesives & sealants) in order to help pass the air test. This meant approving all wet applied materials used inside the building. These all had to be submitted to the architect and Sisk and only used if approved. Audits were carried out to check that these approved products were being used and non-conformances issued if non-approved products found. Storing of paints and composite timber (formaldehyde) was limited to well-ventilated areas of the building and away from future occupied rooms which would have to be tested under LEED. Also, composite wood products had to be either NAF (No Added Formaldehyde) or ULEF (Ultra Low Emitting Formaldehyde). This tied in with seeking another LEED v4 Credit, but the ULEF materials required a LEED recognised test cert resulting in the use of Finnish plywood to achieve this. The essential issue was to limit solvent-based products, as these are generally the highest VOC content and the longest lingering regarding odour. Fire paint is a good example of this – and, to use a manufacturer approved touch-up paint, Sisk had to use a solvent fire-stopping touch-up paint that had a VOC content of 500g/l. To limit the impact of this, the steelwork was repainted to avoid touch-ups during snagging. However, rather than doing this in the last couple of months before the handover, all touch-ups were completed before external cladding being erected to provide the maximum amount of ventilation. The concrete roof slab was poured, so this protected the paint from getting wet. Once complete, all paint was removed from the site to prevent it being used again and a water-based cosmetic touch-up paint sourced that was compatible with the intumescent paint. This was used for any marks that needed to be visually touched-up but didn’t require a fire-stopping repair. 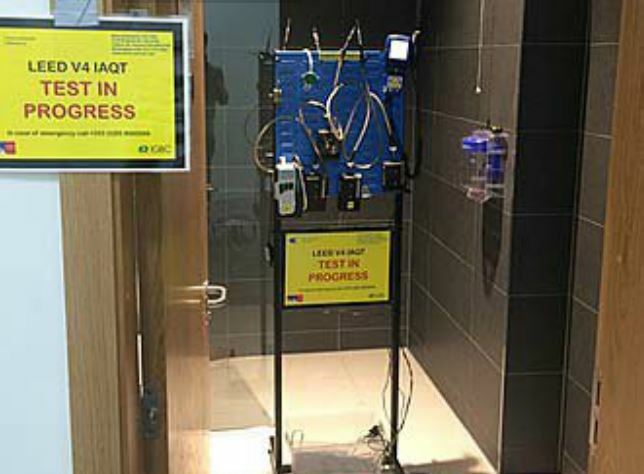 Instead of a time-consuming flush out, Sisk engaged Environmental Efficiency to carry out the Option 2 Indoor Air Quality test. This route is worth 2 Points within this Credit. The schedule impact of this route is much less than a full flush out as it takes less time to conduct the testing on-site. This is the best route to show that the source control measures implemented on the project have been successful in producing occupied spaces with air quality better than the measured limits. Option 2 provides quantitative results for air quality within the occupied spaces of the building. This will provide that airborne pollutant levels within the building are within limits defined in the LEED BD+C v4 manual. There is no need for flushing for this option. There are a large number of requirements that need to be met for the air testing to be considered compliant with this Credit. 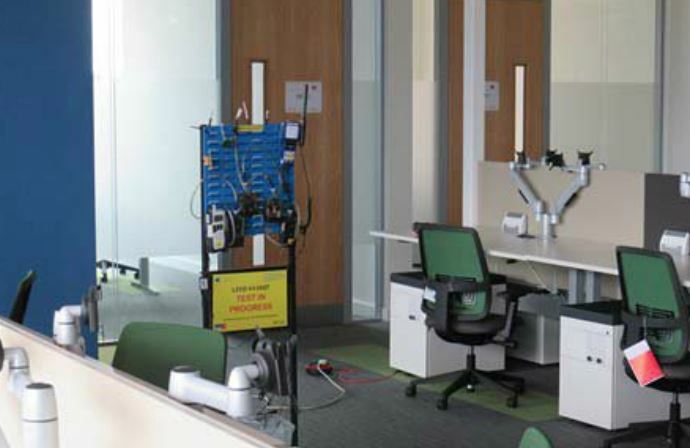 Selecting the quantity and location of the air testing locations is one of the most important factors in ensuring that all representative occupied spaces are testing for air quality which could later impact on those who will work in the building. The requirement is that at least one location per ventilation system for each occupied space type is tested. If the building, for instance, is over one floor only, the requirement to have at least one test location per floor is met by conducting a single air test. 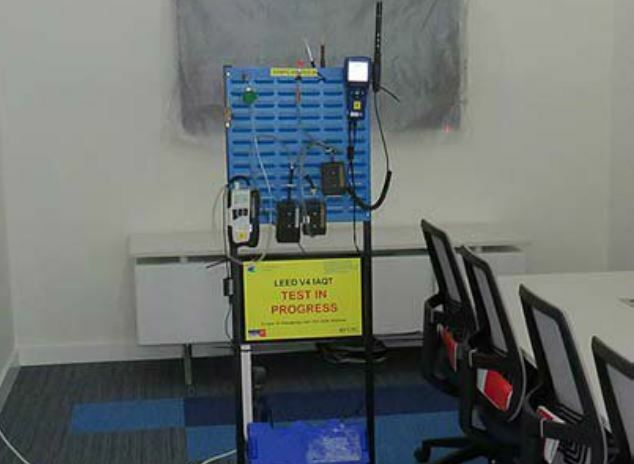 However, the LEED BD-C v4 manual limits the area that an office ventilation system can supply per air test location – that’s something that can be worked out later. The next consideration to be reviewed is the statement that each occupied space type is to be tested. If the space types to be tested are substantially the same in construction, finishes, area and HVAC systems, then it is only required to test one in seven. It must be noted that a failure to meet the substance concentration limits for a test location means that all rooms of that space type require air testing. A detailed review of the ambient air quality must be carried out for the area. In Ireland, air quality standards are covered by the Ambient Air Quality and Cleaner Air for Europe (CAFE) Directive (2008/50/EC) as transposed into Irish law by the Air Quality Standards Regulations 2011 (SI No 180 of 2011). This legislation defines how ambient air quality should be monitored, assessed, managed and the limit values applicable for specified pollutants. The Irish Environmental Protection Agency (EPA) is the designated competent authority to monitor compliance and implement the provisions of the CAFE Directive in Ireland. After all, this was considered, eight locations in total were chosen to be tested. Only four days of sampling were required as Environmental Efficiency had two samplings rigs on site. Analysis of the sampling media took one week. All results came back below their corresponding limits. The author, Bob Sutcliffe, is a director of Environmental Efficiency, a consultancy that is dedicated to helping clients maintain environmental compliance and embrace best practice. The views expressed are the authors.